This is my girlfriend's clock. It was obtained by her grandmother at an estate sale, then passed down to her mother and finally to her. The clock has no labels, or identification of any sort. We were told by someone that it was made around the turn of the century but we're not even sure if that is true. After winding, it doesn't seem to hold time for very long. Really nice detail in the wood. 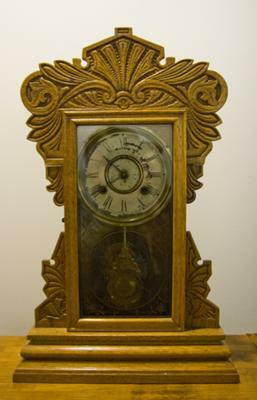 The clock stands about 22 inches at it's tallest point.